Cultivate - Ballincollig Credit Union Ltd.
Six Credit Unions in the Kerry/Cork region have come together and launched a new Agri Loan product called Cultivate in March 2019. 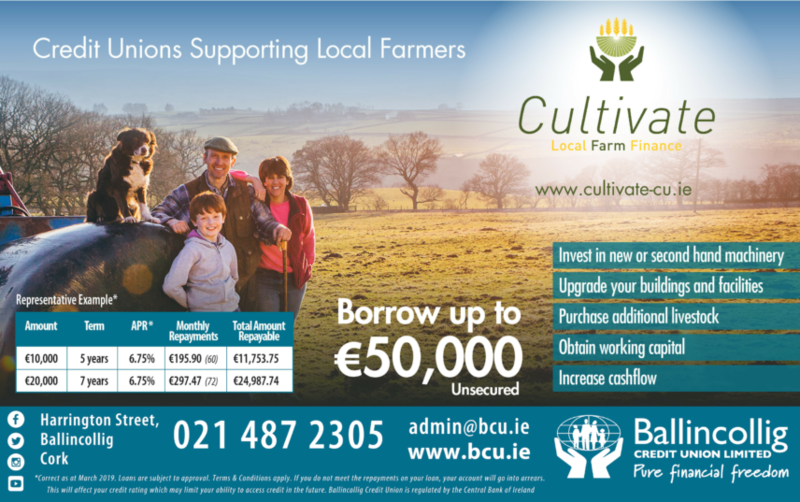 The new Credit Union farm lending offering is branded under the name “Cultivate” and was officially launched on the 20th March 2019 by IFA National Chairman – Farm Business, Martin Stapleton. The Credit Union farm lending project is modelled on a pilot initiative by four Credit Unions in County Galway who launched the Cultivate brand in 2017. Since then 20 credit unions throughout Ireland have introduced the Agri loan product to members. Simon Foley, Manager, Ballincollig Credit Union stated “Having grown up with an agricultural background, I am proud to be able to launch a product that supports an industry that has been beneficial to my family and the greater community. Ballincollig Credit Union is delighted to be in a position to meet the financial needs of members farming within the Lee Valley ”. Further information on Cultivate farm loans – www.cultivate-cu.ie.